Toshiba Digital Solutions Corporation, a leading value creator in digital solutions for industry and society, today announced that its “Meister Series” is one of the “Top Ten Global Scientific and Technological Advances in Smart Manufacturing” of 2018, selected by the prestigious China Association for Science and Technology Smart Manufacturing Society. The award was presented at the World Intelligent Manufacturing Summit 2018 held in Nanjing, China from 10th to 13th October. 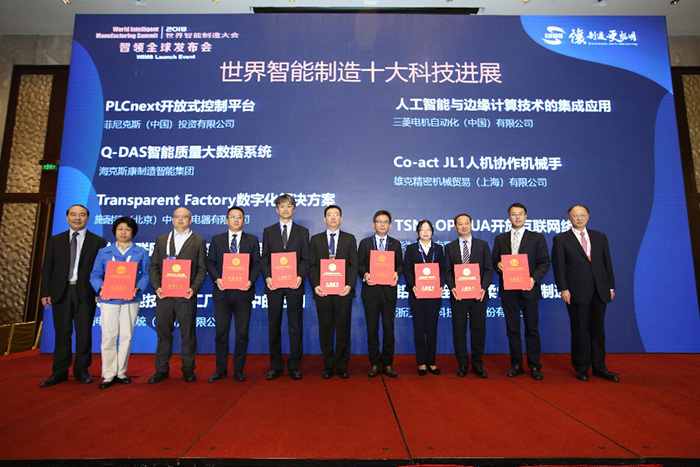 Awarded annually by the China Association for Science and Technology Smart Manufacturing Society, a forum for some of China’ s leading academic organizations in the fields of science and technology, the top ten list recognizes technologies and products that are bringing notable advances to smart manufacturing, in China and the wider world. Factors considered in the selection process include superior performance and results in terms of innovation, application, economic and social contributions, and future prospects. The Meister Series is an IoT solution that collects and stores IoT data and supports their effective use in manufacturing industry. Its scope extends beyond raising production quality and productivity to driving improvements throughout the entire business lifecycle. One component that received high praise in the selection process was the “Meister DigitalTwin” . This data connection platform for manufacturing uses a general purpose data model to automatically convert manufacturing data, and collects data at high speed in time series. Going forward, Toshiba Digital Solutions will continue to strengthen collaborative relations with partner companies overseas, and move forward with global development of the Meister Series.